©2011 - 2017 Alyssa Scheidemann. All Rights Reserved. 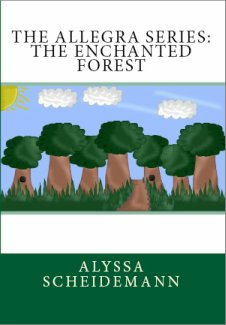 Allegra Sonata, on her way to get a magical herb, finds herself walking through an enchanted forest full of plants and animals she didn't think existed. In print in my eStore (personal signed copies available), Amazon, Barnes and Noble online, to just name a few places. Also now AVAILABLE as eBook for Amazon Kindle, Barnes & Noble Nook, Apple iBooks, and/or your favorite eBook platform! Get your copy Now through your favorite book place!! *Note: The Kindle e-book version is only and now available to be signed through Authorgraph.com!